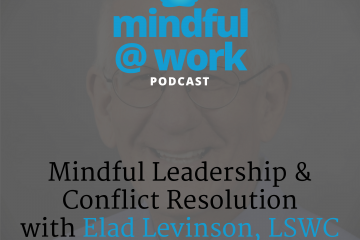 Welcome to a new episode of Mindful at Work. I’m your host, Vanessa Pagan and today we’re talking with Joe Somodi form 20/20 Yoga about more than yoga. Beyond poses on the mat but as it relates to being aware of our physical self as an indicator of how we’re doing on a holistic level in our body, our mind and our breath. Vanessa Pagan: So we’re going to jump in with Joe Somodi of 2020yoga.com Welcome Joe thank you for being here. Joe Somodi: Thank you so much, Vanessa, for having me here I am excited to speak with you. Vanessa Pagan: Excellent Joe. Could you share with us a little bit about yourself and what you do? Joe Somodi: I’m a lifestyle concierge, so how I make my living and simply put I’m the guy that you come to when you want to make a change with your body, your mind or your spirit, and you’re looking to take yourself from where you are now to someplace new. I used the foundation of yoga as a way to do that and yoga becomes a deeper conversation than just doing something of a yoga pose because there’s so many tools and techniques that yoga provides given the vastness of the thousands of years that it’s been around and I use all those tools and techniques to give you a path towards more clarity in your body, mind or spirit wherever you’re taking yourself in the journey and as a concierge I’m here for you along the way, so I’m constantly a reference point if you will. Support kind of a team player, a coach, a cheerleader and as much as anything else a teacher who will help provide you with the right information kind of dissecting all the complicated stuff making it very accessible for you. Then just allowing you to be able to absorb that over months and months so that it becomes a part of you. So much so that you become your own teacher, and that’s really the goal and end of the lifestyle concierge concept and experience is that you become your own best teacher so that you can make your best decisions and you can guide yourself, and you can get rid of any doubt or fear, anxiety, stress and frustration that might come up in the face of the path that you’re wanting to lead the path that you wanting to take. Vanessa Pagan: Wow, that’s that’s a pretty incredible. A lot more than downward dog. Joe Somodi: Down dog’s fun to do, but it doesn’t give you the joy and peace that you most desire. So that’s part of the problem is the pose only is the agitator maybe but it is not the end goal and we get caught up in doing handstand in the middle of the room. Which is an amazing thing to do by the way, and I honor all those people who do amazing things with their body by the way. I think it’s really cool, and we celebrate the physical form by doing all these great poses, but you know the core of yoga was created to be somewhat of an agitator if you will. So meditation is a way to agitate the mind even the body yoga poses are a way to agitate you to some level of discomfort. You realize your breath can’t Be steady your nervous system isn’t feeling good. I just can’t handle this pose anymore, and I need to get the hell out of it. So that’s really why we do the poses and do the breathing and do the relaxation and do the meditation and do all this mindful work because we’re trying to understand a little bit more about what makes us tick as human beings so we can make better choices in our day-to-day life. Both small choices the micro-choices the just getting through the day to day life mundane things as well as the big choices that really define your life and make you abundant and joyful. Vanessa Pagan: That is a much bigger definition of yoga than I am familiar with. How does this big version of yoga? That’s more than the poses and the physical expression, how does that affect everyday people in their regular life? How can it apply there? Joe Somodi: Well we’re trying to live life with less fear and anxiety right? We’re trying to be able to be more confident with the person that we are today. No matter what the body is that we’re in, the limitations that we have physically or mentally, the limitations that we have in our daily life meaning could be financial limitations, could be your instability of your relationship, your home, all the factors that affect the changes of day-to-day life or just the experiences of being human, and we’re trying to find some level of being able to handle all of it. To be steady in the midst of change. To be the eye of the hurricane. In order to do that, you need to practice. You actually need to understand that that is something you need to attune to on a day-to-day basis in order to live from that space. So the inner world actually just needs to get a lot more attention than it does. The outer world gets all of the attention it. Hogs it. It pulls us into all these different directions given the experiences of the Facebook and all of the stimulation we get from the news and all the things that are coming at us from just our job and family life and definitely the holidays is we’re recording this now so all of these things. That’s that’s dominating our mind, and we’re doing nothing to process that information and to really understand how it really affects us on the nervous system on the breath in the mind, and how it’s shaping our choices both consciously and unconsciously. So it I think tuning into that as a daily practice. Calming yourself down physically and mentally giving yourself time to sort of feel and sense the being that you are is very profoundly meaningful in this time and space of culture that we live in and it gives you the power that you’re looking for. If there’s one thing that yoga was created for that everyone should remember. It’s to give you more power. And what are you becoming more powerful to is the ability to do the things that you want to do, the ability to do the things that you do not want to do, and the ability to undo the things that need to be undone. And that’s the definition of freedom. Vanessa Pagan: Wow, that is freedom, You’ve described yoga as a way that people can have power in their life. That’s pretty incredible, Is there an easy beginner thing that someone can do as an exercise to start with this kind of yoga practice? 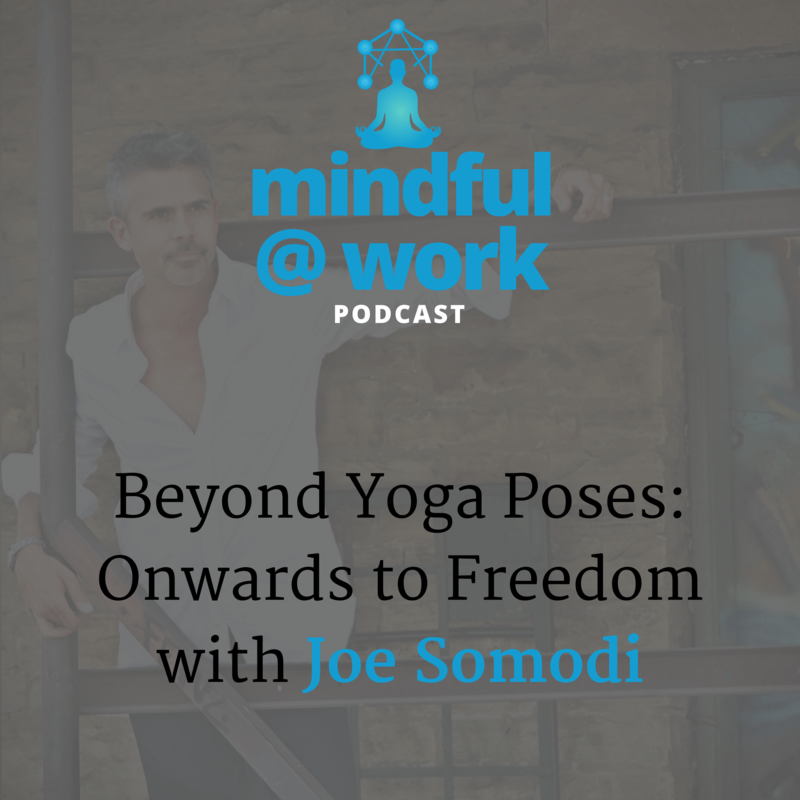 Joe Somodi: Start with the breath. Start with understanding your ability to shape the breath. The fact that you can increase the size of your inhales and exhales and that you actually have the ability to control that and shape that in such a way that affects your nervous system that affects your mind and gives you a different understanding to the body. So the breath is the bridge between the body and the mind. And ultimately the breath is the if I could use the bold word of, decider with how the mind really feels on a moment-to-moment basis. So if the breath is calm if the breath is seated in the right space. Like some people are shallow breathers for example, so that’s space being up in your upper chest meaning that you’re kind of a mouth breather. You’re using maybe 10% of your diaphragmatic capacity to breathe on a daily basis meaning your natural breathing pattern lengthening your breath is in your chest. It’s shallow, and it’s not whole it’s not held in a positive space in your body. That’s one of the leading contexts is being a shallow mouth breather. So we actually make our bank account more important than shallow breathing we make our career and climbing up the ladder more important than shallow breathing. We make our needing to have our legacy more important than our breathing and because we’ve make those things more important Vanessa than we suffer in the end. Our heart suffers, our mind suffers and our mind is full of negative thoughts. It spins constantly. Can’t sleep at night, so we need to take a pill for that. I’m feeling depressed during the day, so I need to take a pill for that and you’re constantly band-aiding all of the issues in order to succeed and get the biggest bank account, and the largest house and in the best car and have this legacy. So yoga, asks you to sacrifice a little bit of your legacy and a little bit of your fame and a little bit of your fortune in order to move towards a space of equanimity inside your body and your mind. Vanessa Pagan: All that through the breath. You know the breath I think we take it for granted because we’ve been doing it since we were born and it’s one of those things that just keeps ticking; just keeps going that I don’t think the things that you’ve described as the external stimuli or prizes or goals they seem like things that we can reach while breath the way that you’ve described the shallow breathing. Can you talk about what a deep breath does and how that changes your body so that that can have importance to reaching to whatever it is that’s important to you? Joe Somodi: That’s a great question and a great opportunity for me just to talk a little bit about the mechanics of breathing. And the sense that when your shallow breathing or when your chest breathing the breath can’t get anywhere other than a certain part of your lungs. So when you take a deep breath in and use your diaphragm and imagine the diaphragm moving downwards this very thin muscle that moves downwards and presses against the organs and abdominal wall and expands your ribs, and then you exhale, and you draw the diaphragm back up and pull the navel in towards the spine and you feel the completeness of that full breath in and out then there is a nervous system change, even in a single breath. Deepak Chopra often says that one breath is a meditation. So you could use the breath to begin to magnify the understanding of the nervous system, which is an important part of calming the mind down so your parasympathetic nervous system this part of you that will be more rest and digested the more calm and easy part of your nervous system that can deal with handle with a lot more of the external world better. That begins to calm down immediately your heart rate begins to slow down. Your muscles begin to relax where they can relax and need to relax. You’re more connected to your physical body this can all be on one breath. Literally, one breath could begin to change and amplify the things about yourself that you need to know more about. Now, of course, one breath is not enough to make a long-term change, if you continue to breathe for two to three to four minutes in a way, that’s smooth and even and circular. Then you’re beginning to teach the body a new way to be and part of it is unwinding. Remember the definition of freedom, I said earlier. It’s unwinding and undoing some of the things that are already done that you don’t want in there, so your nervous reaction to life, your constant reflex to kind of jump at things and and react on Twitter and Facebook and react to the person that’s standing in line next to you that smells really bad, or whose driving like a maniac on the road. Your ability to react to all those things starts to take a different shape and that’s what we’re trying to do is have a different relationship to this outer world and breathing gives you a physical experience that if I could use the word remembrance it’s it’s kind of programmed in as a memory bank that allows you to sustain that more than just the temporary experience of one breath. Which is beautiful. One breath can cause a lot of change but more time in that space gives you the resonance to continue that shape and then it allows you to process life differently. Ultimately what we’re looking to do Vanessa is to become more in control of all of these things. More in control of your nervous system more in control of your breath more in control of your physical body more in control of your mind. I guarantee you, the person who’s eighty years old who’s hunched over in the wheelchair didn’t want to be there. That was not their intention to finish their life in a way that feels very compressed and condensed and limited. I am certain if I’m speaking to people in their 30s and 40s and 50s right now they would hope to be vital throughout their entire life that they have on this Earth because life is truly a gift. So the goal then becomes about well what choices am I making today to be more empowered, to have more power to have a tall spine to have muscles that I can work with that help aid in my bone structure and moving my body what is my breath doing to my nervous system, that’s allowing me to stay with steady in the midst of change. What’s my mind doing? That’s allowing me to make amazing choices that are making my life more bountiful. So that’s where you’re leading your life down the road as long as you’re conscious of all these choices that you’re making then you should have a vital life when you get older. Vanessa Pagan: And I think everyone wants that quality of life whether it’s today, in their golden years or for those around them to show as an example. Joe, I’m really glad that you described meditation can be a single breath. That takes a lot of pressure off of breathing as something you can do just once to change and the idea of the, I call it, like a muscle memory, so if you use your body like you use your other muscles once you try changing them it because easier once they’re in that habit, and if I can start with one breath. I’m going to keep breathing, but if I can just focus on one breath at a time to be slower, deeper than I’m going to change my parasympathetic nervous system. Yes? Joe Somodi: As long as you’re conscious. Yes, and what I encourage your listeners to contemplate is don’t do the breathing as a Band-Aid. Don’t wait until you’ve reached rock bottom wherever you are and you’re completely stressed out, or you’re completely down in your luck, and then you reach for the breathing because that’s like going all the way at the first rung to the 100th rung of the ladder trying to climb your way out of this space of complete heaviness and negativity frustration and anxiety or stress. Whatever it is that’s causing you to want to reach for the deep breathing. So I actually invite people to try breathing deeper when you’re feeling good and notice how it amplifies the moment and be very conscious of what it feels like how to become a little bit more awake with one breath. And that might invite a second or third breath, so it’s just that slow progression of understanding like oh I feel more present when I take a deep breath in and out I feel different and therefore there must be something there that I don’t normally use, the sensitivity or this stimulation that I’m feeling that I don’t normally use on a day-to-day basis, and that’s one of the things I just want to impress upon everyone is that we’re getting a little bit more numb as we get older, and I’m a little concerned as I go walk through my own journey of life. How numb we are getting because we’re closing off on all the emotional stuff. We’re holding our breath a lot more. We’re trying to be super polite in the face of difficult circumstances, and we’re not being able to speak freely in a compassionate and open way. We’re not giving the space to actually be the beings that we want to be and we’re holding back so much is that we tend to have to go to the bar at the end of the day or do something extreme that allows us to get rid of what we’ve been holding back. It’s almost like we’ve been posturing all day long, and then when we get to our privacy of our home I could just be the person I want to be and that’s just the facts of life Joe, and that’s the way it is, and I can’t change that. I really just invite people to say no look, there is a balance. There must be a better way there must be a balance and I’m part of the solution. My choices and my behavior and the way I react to the world must be a part. It can’t always be the other person that needs to constantly change. So we have to look for the Middle Road as the Buddhist say, but also just encompassing all the tools and techniques that allow us to find them Middle Road in a very graceful and compassionate way. Vanessa Pagan: That’s wonderful. Because your idea that we numb ourselves because we have so much sensory input. We don’t know where to put all the things we’re receiving all that all the thoughts that are coming into our mind is to pull we don’t put it anywhere, so it just kind of builds up and through this breathing that you’re describing it sounds like we have a place to let it go. Joe Somodi: The word I would use I hear what you’re saying in terms of put it somewhere. I’d say we don’t have a place to process it. We don’t have a tools or techniques to process it and as a result, it gets stored in the memory bank of the body or the mind right so it gets stored in the muscles it gets stored in the joints it gets stored in the mind with thinking and past experiences of imagery. We have to really question, what we expose ourselves to on a day-to-day basis? Do we need to be exposed to all of these things can we limit some of the exposure so that we are becoming a little bit more directed with our energy and our mind and where we’re placing our body in space and as a result being more purposeful with what we’re exposing ourselves to so that we can process what we’re exposing ourselves to in a better way. Part of what I’m seeing in the world is people are just drawn to continual stimulation and trying to absorb so much that they can’t actually handle all of it. They can’t go through the news feeds of Facebook and Twitter and Instagram and constantly keep up with all of the rotating news of the day be a personal or political and constantly processing all of that. So maybe creating more boundaries in your life, and being more directed and purposeful with what you’re exposing yourself to —including television and movies and all that kind of stuff. So that we can handle what our bodies and minds are ready and able for and then be much more aware of and sensitive to the experience we’re having. The overload is what I’m concerned about. That we’re just that’s where the becoming desensitizes is birthed. 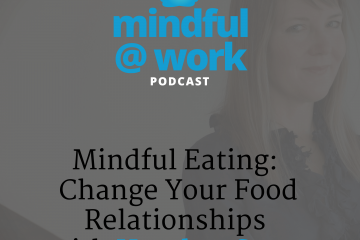 Vanessa Pagan: Yeah, I could see how that would be you know something that you said earlier Joe about if you’re going to practice mindful breathing or focusing on your breathing is to do it when something good is happening or something that is going well. It reminded me of the idea that whatever we focus on expands, so if you spend more time in that good moment or in that lovely moment or that pretty moment or that exciting moment then we’re having more room for it, and that’s not always what we’re seeing when we’re bombarded with news information or other people’s updates on social media and having room for those good moments of our own lives that sounds really important to have. Joe Somodi: The human experience has to be beyond the technology. I mean we’re getting so wrapped up in what technology can do for us on the computer or the iPad or the phone that we’re thinking that’s actually the experience we need to be having. We literally go to the live concert, and we put our phone up in the air to record the live concert as if that’s the only way the memory must be. We forget that what a minute, I’ve spent hundreds of dollars to be at this live concert, and I actually want to experience it. I’m not really experiencing it if I’m busy recording it. Well, I’m experiencing it based on the recording. So I’m not really I’m fully experiencing it from a third-party or I’m one step removed in another way to say it, so yeah. I really resonate with what you’re saying around expansion, and I think when it comes to understanding and getting sensitized and starting a positive practice. Which may be something people will want to do from this conversation, start when it’s good. Start when its steady. Don’t always think that we must go to yoga when it’s bad. I must start to meditate when I’m feeling stressed and anxious. Try to find the moments when there are great clarity and great buoyancy in your life, and use those as an opportunity to go inward because it feels good and it amplifies it just like you said. And another way to say it from my tradition of yoga is where your energy goes where your mind goes and your mind goes where your energy goes. So if you think about your big toe, your left big toe then that’s where your energy goes your thinking about it so therefore your energy is there. So we just have to be more mindful about where your energy is leading you towards and part of it is a thing I teach my students in lifestyle concierge experience is what are we attending to on a daily basis, and that attending is what’s going to be expanding, and how are we conscious of that attention and what we’re attending to. And that’s a big part of growing into your spiritual and inner life world. Vanessa Pagan: Wow, that’s that is plenty of wonderful information, Joe. Thank you for being in this interview today. Is there a way that people reach out to you personally and learn more about you and what you’re working on. Joe Somodi: Yeah, the website is a great place to start 2020yoga.com Perfecting your lens on life is the tagline for that. So 2020yoga is the way to think about perfecting your lens meaning the clear you see, the less pain you have less suffering you have and but I’ve been courage people to reach me via email which is a wonderful place to start a dialogue, joe at 2020yoga dot com. I’m also on Facebook every Monday morning, live 5. a.m. Pacific 8 a.m. Eastern, and I lead a very simple mindful meditation in the morning to kind of get your week started so you can always Facebook me on my name Joe Somodi and become a part of that experience, and it’s a great thing to do live because I’ve got a bunch of people who they’re there and kind of commune together in this internet cyber world and get all grounded and connected before the week starts. So those are those are some great places to begin to connect with me, and I lead regular meditation challenges. I travel around leading workshops around the country. But I really do encourage people to consider the lifestyle concierge program as a possible way to enliven the inner life to understand your inner life better to be more connected to something that’s not easy to be connected to and all great students need a great teacher, so perhaps there’s a synergy between you and I to be your teacher, but it’s always good to be out on the lookout for a great teacher that can guide you really mindfully and gracefully into your inner life and make that a part of your worldly experience. Vanessa Pagan: Wonderful so if someone was interested in getting in touch with you for that would the best way to be emailing you, or is there somewhere on their website they can go? Vanessa Pagan: Great. Thank you for your time today, Joe. This has been an enlightening and expanding breath conversation. Joe Somodi: I’ve enjoyed it a lot, Vanessa. So thank you so much for the time.